The Rehabilitation Research and Training Center on Employment of People with Physical Disabilities at Virginia Commonwealth University is conducting a study of adults with physical disabilities on employment. 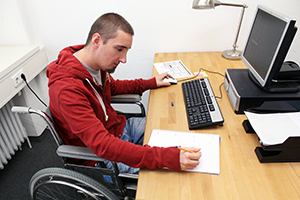 The purpose of this research study is to test different ways to deliver employment information to individuals with physical disabilities (i.e., spinal cord injury (SCI), cerebral palsy (CP), and multiple sclerosis (MS) and other physical disabilities). We are hoping to learn more about how individuals with physical disabilities use social media, specifically Facebook, to obtain information on employment as well as connect with other people who have the same disability. The study will last for six months. However, individuals can spend as much or as little time as they choose interacting in the Facebook group or reviewing the materials disseminated through a monthly Email. They may be employed or unemployed. An individual must be between the ages of 18-65 and able to provide legal consent to participate. Please forward this information if you know of someone with a physical disability who would like to participate. If you have questions, please contact Dr. Inge at kinge@vcu.edu.